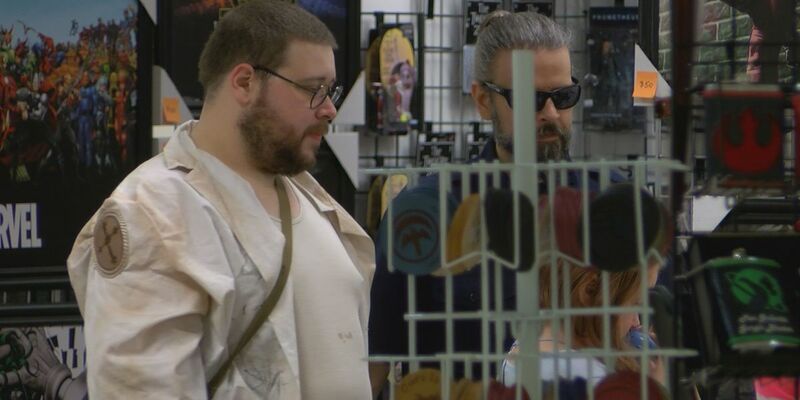 LOUISVILLE, KY (WAVE) – After multiple guest cancellations, an abrupt venue change and several upset fans, Fandomfest continued on with its first day at the former Macy's in Jefferson Mall. Many attendees seemed to be amused with the fact that the convention was held at a former mall. The organizers said things are going as planned. An hour into Fandomfest, what used to be a Macy's became packed with fans, characters and vendors. "We didn't know we were coming to the convention until about a week before," Lillian Nosworthy said. Nosworthy was dressed as the main character of the anime film Princess Mononoke. Nosworthy said the last minute decision was a good one. She said she didn't mind that dozens of celebrities have canceled their appearances. "I wasn't like mainly coming for the guests," Nosworthy said. "I came for the experience." Near the main entrance, ushers and security guards managed the lines that were leading up to the check-in counter. The new location, with its former-mall-glory, proved to be more of an attraction than a distraction. The signs inside the mall were still up, former jewelry and makeup counters still intact. "I think it was pretty brilliant that they decided to put it in the old Macy's," Nosworthy added. "There's a lot of space in here, a lot more space than I thought it would be." Organizer Myra Daniels said the new venue came around with good timing. "The fans asked for this, so we did it for them and the vendors," Daniels said. "There were some things that we didn't come to terms with the Expo center and this fell into our lap." Celebrities like Julie Dolan, who voiced Princess Leia, agreed that the new location was interesting. "I was curious to see how that would work but the parking is great, there's a food court close by and it's huge," Dolan said. Despite the mandate from the fire department to keep a strict occupancy of 1,700 people, Daniels said she doesn't think waiting to get inside the convention over the weekend is going to be a problem. "There's very few times that there's so many in a building that you can't help it," Daniels said. "You might have to wait a little bit but you won't have to wait long, I wouldn't anticipate." Fandomfest continues on Saturday and Sunday. Doors open at 10 a.m. until 7 p.m. on Saturday and 11 a.m. to 4 p.m. on Sunday.